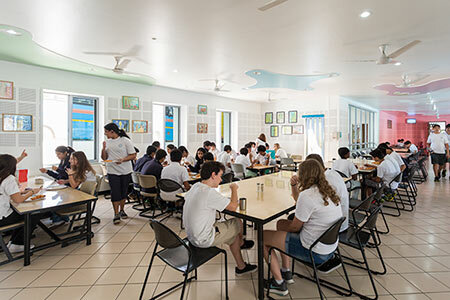 Hot and freshly prepared lunches are provided in school : both Indian and Continental. The food is cooked in house on campus and quality is supervised by the school. The catering has been outsourced to an international food service provider Sodexho. Students also have the option of bringing their own lunches. All students must bring snacks for their snack break. 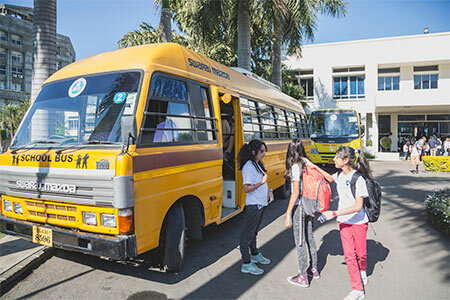 Transport for MBIS School is operated by the School Administration.All MBIS buses comply with RTO requirements: the distinguishing yellow colour, speed control systems, stop arms, seat belts and many other features. All our buses have been fitted with Global Positioning Satellite (GPS) systems that enables us to monitor the movement of the buses at all times. Our buses travel on fixed routes picking up students along the route. All bus drivers have a “School Bus Driver badge” issued by the RTO, and each bus also has a bus conductor to assist with student comfort, safety and security. All students are provided with RFID identity cards. Students are required to swipe their cards on entry to the bus and on exit from the bus thus providing an accurate record of who traveled on each bus. The MBIS medical unit is looked after by a qualified nurse with a doctor on call. The doctor visits the school every Tuesday and Thursday for an hour. The nurse is available throughout the school day. 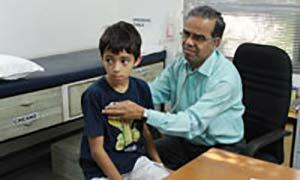 A well equipped medical unit is situated in the B-block of the school, to handle first-aid cases and minor ailments. For emergencies, the school has an agreement with a super specialty hospital, situated approximately 5 KM away to address any medical emergencies.